The LoRa and LoRaWAN wireless IoT (Internet of Things) wide area network (WAN) protocols – what are they, for which IoT use cases and applications are they suited, how do they work and where do they fit in IoT connectivity and communications? IoT projects, solutions and deployments need more than the connected physical objects and the data they ‘sense’ and capture. The physical ‘things’ and sensors/technologies in IoT devices, assets and things in IoT, consumer IoT, enterprise IoT and Industrial IoT also need technology to communicate about their internal state and/or external environment. On top of that, data and analyzed data which pass from the device level to the next levels need to be sent across communication networks in all further stages of the big IoT solutions picture. These communication needs play on all levels: between IoT devices, between, with and in IoT gateways, IoT platforms and/or databases, fog computing nodes, other cloud applications, business platforms, industrial systems; the list is endless and depends on the type of IoT application and (use) case. IoT network protocols and technologies come in many flavors. They can use fixed line networks (e.g. Ethernet), cellular networks (e.g. GSM), close-range wireless technologies (e.g. NFC, RFID and, further, Bluetooth or ZigBee), satellite and more, again depending on many factors. They can concern communications over very short distances and over very long ranges. And they can need different data speeds, bandwidth and underlying network technologies. The fastest growing category of IoT connections, also in Industry 4.0 deployments concerns wireless IoT connectivity. It’s here that we meet LoRa and LoRaWAN, more specifically in the category of wireless wide area network technologies that need to cover a long range but need little power and low bandwidth, commonly known as LPWA networks or LPWAN (low-power, wide-area networks). LPWAN and LoRa(WAN) as one of the major non-cellular forms of LPWA technologies thus are an excellent fit for applications in the scope of smart cities, smart agriculture, environmental monitoring and far more, including industrial applications. An overview of LoRa and LoRaWAN – what they are, what they offer, how they work and why/how they are used. Where does LoRa(WAN) fit in the IoT connectivity space? Which kinds of IoT applications does LoRa(WAN) enable? Is LoRa a good fit for the connected home? Is LoRa(WAN) better than its competitors? LoRa is a radio modulation technology for wireless LAN networks in the category of LPWA network technologies. LoRaWAN is a network (protocol) using LoRa. LoRa and LoraWAN belong to the category of non-cellular LPWAN wireless communication network protocols and players, operating in the unlicensed spectrum, where also others such as Sigfox, Ingenu and several more operate. LoRa is a proprietary wireless RF technology, belonging to Semtech which also is one of the driving forces behind the LoRa Alliance where the open LoRaWAN protocol and ecosystem is developed and keeps being developed. The LoRa Alliance has hundreds of members since it was founded in 2015. LoRa and LoRAWAN, along with Sigfox, de facto have become the main non-cellular LPWA ecosystems and solutions. Since there were no cellular LPWA options (e.g. LTE-M) for the types of IoT projects and use cases that are typical for LPWAN and existing cellular standards were too expensive and not really fit for those specific IoT use cases, the LoRa Alliance, Sigfox and others have a longer history than more recent cellular standards. They also have strong ecosystems of hardware vendors, developers, partners, IoT platforms (which, on top of IoT device management, data management, security, application enablement and so on also deal with the connectivity layer, especially in network connectivity provider platforms), system integrators, IoT technology/solution vendors and telecommunication providers, to name a few. With 3GPP cellular LPWA standards ratified and used there isn’t just competition between non-cellular ecosystems (whereby mainly the LoRa Alliance and SigFox are heavily competing, although they often won’t really call each other competitors as they have an entirely different approach) but also between cellular and non-cellular players. Cellular standards include LTE-M and NB-IoT. The competition in practice is higher between Sigfox and cellular than it is between LoRa and cellular: many operators offer both LTE-M and LoRaWAN as they deem it complementary as we’ll see. When we first wrote this overview and cellular LPWA standards weren’t standards yet, LoRa and LoRaWAN mainly were positioned in comparison with local area networks for short-range communications and the cellular networks in traditional M2M as the old image below shows (well, not that old, 2015). In the meantime, that has changed (and the link to the image vanished). What hasn’t changed is that LoRa and LoRaWan are still in the wide area and low power sphere. LoRA, LoRaWAN and other non-cellular protocols operate on lower frequencies than cellular networks do. This is also known as the unlicensed spectrum. That’s why often we also refer to licensed and unlicensed LPWA ecosystems. The difference between LoRa and LoRaWAN is that LoRa is the chird spread spectrum radio modulation technology that is used in LPWA networks of which LoRaWAN is the best known but not the only one. Chird spread spectrum of CSS uses wideband linear frequency modulated chirp pulses to encode information for those who want the technical details – the modulation technology for LoRa was developed by a French company Semtech acquired (more below). If you know the good old OSI protocol stack with its seven layers: LoRa sits on the data link layer (link layer protocol) while LoRaWAN, developed by the LoRa Alliance, also includes the network layer. LoRa and LoRaWAN are used by many, originally mainly European, telecommunications firms with operators such as KPN, Orange and Proximus being among the first movers. It might sound weird that mobile operators with their cellular networks also worked to ensure LoRaWAN network coverage across several countries. Yet, it isn’t. Partially it relates to market conditions and to the mentioned historical reasons but it’s also a matter of pragmatism. Customers wanted the best options for LPWAN use cases, existing cellular M2M solutions weren’t really part of that and it didn’t exactly make sense to wait. This also led to a somewhat strange situation whereby in some countries an operator supports LoRaWAN but in others can’t or doesn’t as another, competing operator moved in first. Several IoT projects which leverage LoRA and LoRaWAN (and their competitors) already were tested and deployed before the three cellular LPWA standards were even ratified. And some companies, including big ones, have continued to deploy ever more IoT use cases with LoRaWAN and the likes. If you add cellular LPWA, the adoption of LPWAN is growing fastest, also in Industrial IoT wireless connectivity. There is a lot of buzz regarding LPWAN (and always has been) with now most buzz on the cellular level, even if some cellular standards such as NB-IoT are not really used at scale yet and the journey to 5G and IoT, in which cellular LPWA standards also fit, is still a long one despite all the buzz (with some exceptions on a regional level such as the US and parts of Asia). Operators are making choices as gradually there is a 2G network sunset, yet only since early 2017 and certainly far from everywhere in an even longer future. Chance is higher that 3G networks will be switched off first in several countries. The LPWA market, although not being that new if you know the non-cellular space, de facto really is rather young and still very diversified and evolving. Even it’s only a limited part of the overall IoT connectivity market, it however is growing fast. In the meantime, many operators clearly made a choice for a continuing mix of cellular and non-cellular. Orange, for instance, sees LoRAWAN and LTE-M as a perfect combination and it’s not the only one to combine both (in markets where they can). That’s where the previously mentioned view of LTE-M and LoRaWAN being complements rather than competitors comes in. Also the LoRa Alliance sees LoRa and cellular LPWA, especially LTE-M, as complements and there are more operators offering both LoRa(WAN) and LTE-M. Attention: Orange doesn’t offer LoRaWAN everywhere as in the end the market situation still dictates. In Belgium, for instance, local Orange competitor Proximus is the clear LoRaWAN leader and Orange Belgium goes fully NB-IoT and LTE-M, in other words celluar LPWA (and has little choice). It’s indeed an example of the mentioned pragmatic approaches where others moved in first in some countries. This is where to see LoRa and LoRaWAN in a nutshell. Now a bit more details on the technological, use case and roll-out level. Do note this page is being updated and some parts still refer to 2016 and 2017 evolutions. LoRaWAN and LoRa were already widely available in several European countries since mainly 2016 (nationwide, for specific applications and pilot projects and/or moving beyond local deployments). The LoRa technology also has a European background as does LoRaWAN for that matter. In other regions across the globe (from Asia-Pacific to Africa and the US) LoRa has become increasingly used over the past years and keeps expanding its range. On June 30th, 2016, The Netherlands became the first country in the world to have a nationwide LoRa network for Internet of Things applications (with operator KPN). As mentioned in the introduction LoRa and LoRaWAN are LPWAN technology for long range, low power and low bandwidth IoT applications (just like Sigfox and Ingenu). The SlideShare above nicely explains that – and more. A few words on the background, usage and first standardization. The radio wave modulation technology behind LoRa was developed by engineers at French company Cycleo which was founded in 2009 and acquired by Semtech, a supplier of analog and mixed-signal semiconductors, in 2012 to “complement” the latter’s long-range low power radio frequency technology portfolio. The technology was incorporated in future Semtech Rradio frequency platforms with the known results. The patented LoRa wireless radio frequency technology stands for the physical layer protocol (in the mentioned OSI model) while LoRaWAN, which is officially developed by the LoRa Alliance (but really is by a few companies as we’ll see; yet now the alliance is building upon that and it was founded by the key stakeholders anyway) stands for the media access control (MAC) layer protocol, leveraging and including the physical LoRa modulation of Semtech. LoRaWAN networks, using the LoRaWAN protocol are offered by over 70 network operators and there are LoRaWAN IoT deployments in more than 100 countries, which however includes private LoRaWAN deployments as well (a difference with Sigfox as mentioned which has a different goal). The first LoRaWAN standard was announced in June 2015 and since then things have gone fast. That first “LoRaWan R1.0 Open Standard for the IoT” stipulated that LoRaWAN data rates range from 0.3 kbps to 50 kbps. In order to optimize the battery life of end-devices, network capacity and easy of deployment/scale, the LoRaWAN network server manages the data rate for each connected sensor via an algorithm, known as the ADR or Adaptive Data Rate algorithm. In 2017 LoRaWAN specification 1.1 was released. The lower frequencies which LoRaWAN uses, compared with cellular protocols, are known as the unlicensed spectrum, more specifically the unlicensed radio spectrum in the Industrial, Scientific and Medical (ISM) bands. This is comparable to Wi-Fi. In Europe LoRaWAN mainly uses the 868 MHz SRD band and in the US 915 MHz. LoRaWAN also typically uses a star topology instead of the mesh topology as in, for example, ZigBee (nowadays we speak about a star-on-star topology for LoRaWAN). LoRa is used by several telecomproviders. In a sense it’s a type of network such as, for instance, a 3G network, built for communications between several Internet of Things devices and with data gathering systems, whereby data transmissions typically need to happen now and then. Other providers of LPWAN systems (and LoRaWAN competitors) include the previously mentioned Sigfox (another ultra-narrowband-based technology), which carries the name of the French company that came up with it and already has a strong presence in the US, and Ingenu. Also cellular options, among others NB-IoT and LTE-MTC (LTE Advanced for Machine Type Communications) or LTE-M are ranked in the LPWAN category. With LoRa and LoRaWAN, the key players wanted and want to provide an offering for companies that are seeking to deploy Internet of Things applications fast in areas where large distances are involved, yet low capacity is needed, for instance in a smart city or a logistics digital transformation project (more use cases below). In other words: it’s not what you will use in, for instance a context of connected cars where more network capacity is needed or in the context of oil and gas IoT applications, to name a few. Because of the low frequency and the specifications of LoRa as we mentioned them before, it is also low power which makes it suitable for connected devices with small batteries. Examples of applications where it can be used include smart parking and all sorts of other smart city applications (e.g. traffic, smart waste management, smart metering in general), applications to control connected devices at home from a longer distance, localization, logistic applications, farming, smart meters, security applications, mining, the list goes on. In other words: LoRa is suited for many of the Industrial Internet of Things applications at which business and governments are looking today and where it offers an alternative for less ubiquitous connectivity solutions (outside that is) such as Wi-Fi and more expensive types of connectivity, such as cellular connections. Long range enables solutions such as smart city applications. Low power means long battery life for devices. Low bandwith makes it ideal for practical IoT deployments with less data and/or with data transmissions which aren’t constant as you can read in the Hamburg bridge and the lightning detection cases below (and also in, for instance, waste management where you just need to know whether a waste bin is full or not or in smart parking where you want to ‘know’ if a parking spot is free or not). Wireless, easy to set up and fast deployment. Security: a layer of security for the network and one for the applicaton with AES encryption, not a luxury knowing the concerns and security risks regarding IoT. Open: an open alliance and an open standard. Cisco developed a LoRaWAN offering whereby LoRa, WiFi and cellular are brought together. Cisco’s LoRaWAN offering, a boost for LoRa, is primarily targeting on vertical industry use cases and applications such as asset tracking and management, logistics, utilities, smart cities, digital ceilings and agriculture. In the PDF which describes Cisco’s solutons for LoRaWAN we, among others also see environment monitoring, leak detections and street lighting as the image from the brochure (PDF opens) below indicates. With its focus on the long range LoRa is not ideal for many indoor smart home applications. However, it does get used and you can certainly use it for some smart home applications with an element of distance. Think about an application to open a garage door or to turn devices on and off while being further away. For smart home applications where distance is less of an issue we typically use Wifi, Bluetooth or short distance solutions which are designed for home automation such as Z-Wave or ZigBee. We often use both terms interchangeably but there is a difference as previously mentioned that has to do with those OSI layers. If you remember the good old – very old – OSI or Open System Interconnection Model, you also might remember that there are several layers in this conceptual model. The first layer is the physical layer. LoRa, is the physical layer or the (wireless) modulization which creates the long range communication link. LoRaWAN is about the communication protocol and system architecture for the network as the LoRa Alliance puts it. Or even simpler: LoRaWAN is the network (WAN = Wide Area Network). Semtech is the owner of the LoRa intellectual property. The company among other sells semiconductor solutions such as LoRa transceivers and gateways on top of several other solutions such as ICs and more. Other manufacturers of LoRa and LoRaWAN equipment, from sensor boards and modules to gateways and more, licensing the LoRa IP, include STMicroelectronics, Microchip, mcf88, AllThingsTalk, Gumstix, Adeunis, Netvox Technology, Telit (also a leader in IoT platforms, strong in IoT device management, recognized among the Industrial IoT platforms, the edge platforms and more), Libelium, Yokogawa Electric Corporation, Lite-On and others, it just depends on what exactly you seek for which type of application, use case and industry in what region. The LoRA Alliance LoRaWAN certified products page shows precisely that and there is of course this thing called Google. There are also IoT marketplaces that can come in handy since, as far as we can tell, theLoRA Alliance LoRaWAN certified products page is not searchable. Libelium’s “The IoT Marketplace” is one for those looking for LoRa and LoRaWAN products. Others include The Things Network, French LoRa leader Actility’s ThingPark Market (EU-only) or Click&Go and marketplaces or online stores from previously mentioned and other companies, ranging from operators to the developer portal of US-based LoRaWAN pioneer Senet. On a sidenote: the role of the LoRa Alliance is to further promote the LoRaWAN open standard which nowadays officially is said to be developed by the alliance as we previously said but, it really is the result of a collaboration between that other French company we just mentioned, Actility, IBM Research and Semtech that thus owns the (IP of and) the technology that is used in the chips. An initial point of comment regarding LoRaWAN was that de facto only Semtech sold the chips but now that is called a misunderstanding and, indeed, others, such as STMicroelectronics and so on, did join the pack as was promised in the early days and as mentioned. Whereas the LoRa Alliance and the approach of its founder, Semtech, has seduced several telecom firms, operators aren’t the only partners of the alliance. LoRaWAN networks are also being used by developers, integrators and a range of other companies, including startups which have a very vertical solution. This strategy differentiates the LoRa Alliance from one of its main competitors, Sigfox, which has opted to work with network operators and keep ownership of most of its technology (except the endpoints). The goal of Sigfox is to become the world’s largest IoT network by working with an operator per country. While the LoRa Alliance obviously also seeks (and has found) partners for nationwide LPWA networks as you could see in the list above, its more open nature allows more options. Whereas Sigfox goes for public networks, LoRa also enables to deploy a private network which is often needed in IoT applications. This is a business advantage as, when it boils down to working with operators, the risk is there that ultimately they start working with technologies which are designed for them (and their own networks). And there is a lot going on in these cellular IoT environments. You can really find LoRaWAN in virtual all areas and regions, also where there is no public network. If you look at the various companies in the LoRa ecosystem, you’ll see that there are applications everywhere, on top of the many nationwide LoRaWAN deployment plans. One of them, LORIOT.io, for instance, which developed a LoRaWan cloud, is present in over 70 countries, including Rusia, China, a large part of South America and several African countries. An example of a company that has built a solution for the Internet of Things, using LoRaWAN, is Cattle Trax. This US start-up offers an IoT livestock monitoring solution using sensors, built-in IDs and tranceivers whereby a LoRaWAN network architecture is used as Network World reports and visually describes. All the telecom operators and the various partners in the LoRa ecosystem, including LORIOT.io and obviously Semtech, are gathered in The LoRa Alliance. The LoRa Alliance “has a mission to standardize Low Power Wide Area Networks (LPWAN) being deployed around the world to enable Internet of Things (IoT), machine-to-machine (M2M), and smart city, and industrial applications”. And this standard obviously is LoRa. As the mission statement continues “the alliance members will collaborate to drive the global success of the LoRa protocol (LoRaWAN), by sharing knowledge and experience to guarantee interoperability between operators in one open global standard”. You can check out an overview of all members (and their sites where you’ll find plenty more IoT use cases using LoRa and of course a bunch of additional info on LoRa and LoRaWAN). The site of the LoRa Alliance also has information for developers and a library of resources. Finally, you can also read about the technology and the previously mentioned LoRaWAN standard which was released in June 2015. Are LoRa and LoRaWAN better than other technologies (NB-IoT, Sigfox, etc.)? The future will tell and we will cover the other technologies too of course. It’s clear that LoRa is de facto dominant in a few (mainly European for now) markets in the public IoT network space. LoRaWAN has the benefit of being an alliance with an Open approach instead of a proprietary one. There are also technological differences between the various solutions which we’ll cover more in depth in another article. However, the main question is and remains: what goals do you want to achieve with your Internet of Things project? And then comparing and understanding the various options is never a bad thing. Moreover, the usage of LoRa will evolve and no technology is perfect. In an interview, Orange’s Luc Bretones, for instance, says that while the openness of LoRa is a benefit compared with the proprietary approach of Sigfox but, along with its reliance on unlicense spectrum this openness is also a problem. Orange plans to take LoRa’s strong points and integrate these in a future cellular standard, Iain Morris, who conducted the interview, wrote on LightReading. Of course there are other factors that play a role in such decisions and not everyone in the LoRa Alliance has the same views or approach. Remember how Cisco built its offering, for instance. In the end it’s very simple: it’s rarely about ‘this’ versus ‘that’ technology. In most cases it’s about ‘which mix of technologies will make me reach my IoT projects goals?’. Just like in any area of business and technology there is rarely a one-size-fits-all solution, except in rudimentary IoT projects. In an age of hybrid ‘anything’ (just look at the cloud) it would be wrong to think that one IoT technology, whether it concerns connectivity or anything else, is THE ultimate solution for all needs. The LoRaWAN offering of Cisco again is proof of this as is the fact that some providers of vertical IoT solution platforms support LoRa but also others such as NB-IoT (a narrow-band radio technology designed for the Internet of Things). Of course that is their business duty. An example: LoRa Alliance member Flashnet has a LoRa and LoRaWAN street lightning solution, called intelliLIGHT as the image below shows. In fact, it was the first LoRa street lighting control solution globally. However, intelliLIGHT’s street lighting control solution won’t just be available using the LoRaWAN LPWA approach. Soon it will also be available for NB-IoT too. 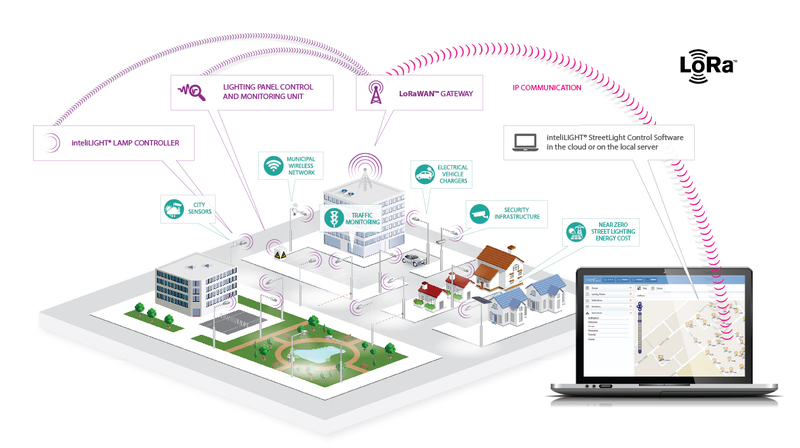 Deutsche Telekom has asked Flashnet to develop the first NB-IoT compatible streetlight control solution. As you can read here the functional controllers are expected to be ready end 2016. And, of course the image below is very similar to the LoRaWAN image above. Vodafone is pushing very hard for the NB-IoT standard. Yet, it’s not very likely that the done investments in public LoRA networks which telcos have made will be replaced just like that; or at least not for now – and, again, it’s not a ‘this or that’ question. Obviously customers who opt for LoRaWAN to develop IoT projects or even solutions don’t need to worry at all. Even if one day NB-IoT or whatever cellular IoT approach would make all telecom providers change their strategies, the fact that the LoRa Alliance has this more open approach and also enables private IoT deployments and solutions such as Cattle Trax and others is key. In case you need a full technical overview of LoRa and LoRaWAN: click here to open the PDF. You could already discover an Internet of Things application in the context of livestock Internet of Things use cases and lighting previously. Obviously there are many more, here are a few. In a June 2016 blog post Cisco’s Tony Shakib announced several new Internet of Things solutions, including for the Cisco solution for LoRaWAN offering. One of the companies which selected the solution as part of its digital transformation strategy is the Hamburg Port Authority. Sensors are installed along the entrance bridge to the port and LoRa enables precise and predicitive maintenance and repairs planning. In the press release about the German Netzikon LoRaWAN network plans another existing IoT use case, using LoRaWAN, is mentioned: sensors detecting when lightning struck the turbine bladers of wind power generators. The data is communicated through the LoRaWAN network, leading to a faster resolve of potentional damage. Which countries have LoRaWAN coverage and who offers LoRa? Although LoRa is a cheaper alternative for cellular connectivity in practice it is offered by several telecom players who have a cellular offering (2G, 3G, 4G) and see it as an additional offering on top of cellular, Bluetooth and WiFi (each with their typical use cases). Bouygues Telecom (France), also promising nationwide LoRa coverage by end 2016 and offering IoT services with its subsidiary company Objenious. Unidata, an Italian telecom company, which announced the roll out of a LoRaWan network on June 14th. Initially this will be done in Rome with the promise of a full coverage of the city by 2017. Netzikon, not a telecom firm but the name of a LoRaWan network which is present already in Stuttgart and will be rolled out nationwide in Germany by 2018 according to an October 4 press release by LPWAN provider Actility. In several other countries there are plans for nationwide deployment, local applications and/or trials. As mentioned, in the US Comcast is about to test LoRaWAN IoT networks in two markets as Sue Marek reported on SDX Central on October 7th. Philadelphia and San Francisco have been selected for trials in IoT applications such as asset tracking, utility metering and environmental monitoring. If the trials are successful within the next 18-30 months another 28 ‘markets’ should follow. However, there is already another actor present in the US too. Senet offers the first public Low Power Wide Area Network (LPWAN) for Internet of Things applications, using LoRa(WAN) in North America with coverage in more than 100 US cities since June 2016. It plans to cover twice as many in 2017. On September 20th, Semtech (the company behind LoRa and LoRaWAN) said it is deploying a LoRaWAN -based network in New Zealand, promising that half the population should be covered in a ‘matter of months’. From Zealand we go to Australia where also in September the launch of one of the first IoT networks in the country was announced, more specifically in Sidney, as ZDNet reports. This list of announcements and the dates they were made clearly show that the interest for LoRa and the Internet of Things is growing fast and that LoRaWan initiatives are being deployed fast. As Europe already has several LoRaWan offerings and projects and with the US trials ahead, a key focus is of course the Asia-Pacific region as is the case for all IoT providers. On top of Australia and New Zealand (part of the APAC region), several initiatives are being deployed in Asia and Semtech and others are regularly present at events in the region. On September 14th, Telecom Asia covered the plans of Japanese operator SoftBank to deploy a LPWAN network using the LoRaWAN protocol in its current fiscal year. In India, Tata Communications already announced end 2015 that it would deploy a LoRaWAN network which had been trialled in Mumbai, Delhi and Bangalore. And on July 12th, Semtech released a statement saying that the nationwide deployment of a LoRaWAN IoT network in South Korea by local telecom provider SK Telecom covered 99 percent of the population. ElectronicsWeekly.com posted an overview of several European initiatives, including a smart city project with LoRa in Gothenburg (Sweden). In 2015, BizTech Africa mentioned that provider FastNet’s LoRaWan network already covered more than 40 percent of South Africa. Top image: Shutterstock – Copyright: wavebreakmedia – All other images are the property of their respective mentioned owners.